It also benefits from outstanding instrumentation. Like several previous Ducatis the Monster has a digital display that changes with riding mode, in this case switching between three elegant, iPhone-like screens. Urban displays the speedo and clock prominently, Touring adds the tacho and other info including fuel consumption, Sport is purposefully minimalist with revs to the fore. Each display can be customised, and settings are saved when the ignition is turned off. 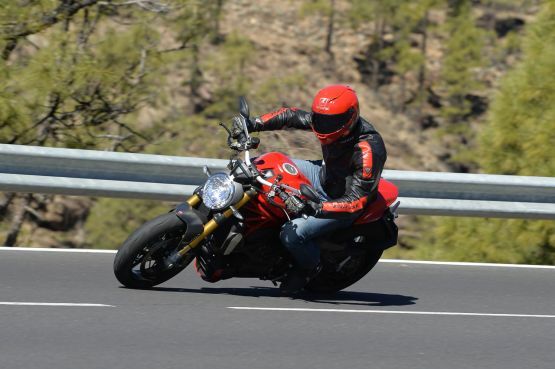 I began in Touring mode as we headed eastwards along Tenerife’s north coast from the launch base at Buenavista, and was immediately impressed by the Ducati’s easy speed and manageability. Worries that the liquid-cooled motor would lack Monster character were soon forgotten. The eight-valve desmo unit doesn’t have the air-cooled V-twin’s rustling charm, but there’s plenty of exhaust rumble and a pleasantly long-legged feel that made the bike fun to ride at a fairly gentle pace. Low-rev response was very strong, with usable torque from below 3,000 RPM and notably more grunt right the way through the range. In fact, by just 3,500 RPM the eight-valve unit is already making 105 Nm, slightly more than the 1100 EVO unit produced when it reached its maximum at 6,000 RPM. As that suggests, overtaking traffic on the coast road was simply a question of tweaking the very precisely metred throttle, with barely a down-change required through the smooth six-speed box. Switching to the Sport mode was a simple job of pressing and holding the indicator switch, and closing the throttle. 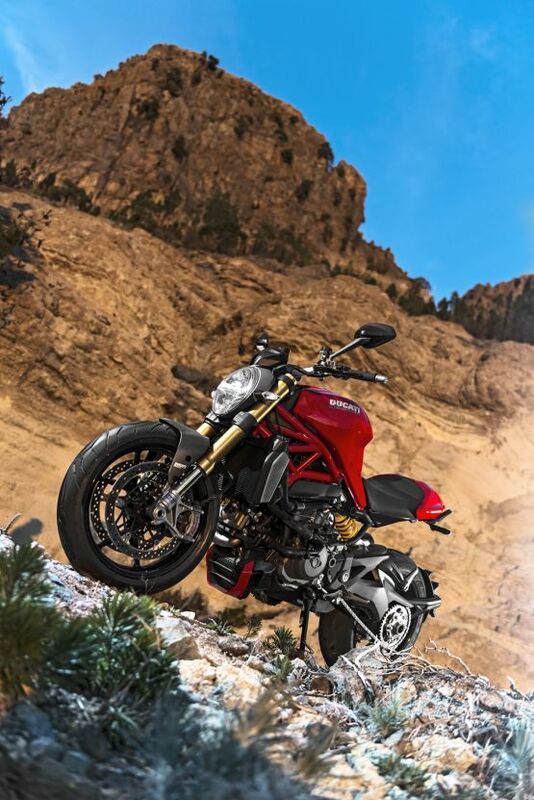 Immediately the throttle response was notably more immediate, the Ducati leaping forward with a snarl from the twin silencers by my right boot, and a more urgent jolt of acceleration. When you’re riding harder the 1200S’s advantage isn’t just that it’s still piling on torque after six grand, when the air-cooled unit would be running out of breath. As I discovered on a short burst of motorway to La Orotava, the eight-valver carries on revving smoothly to 10,000 RPM if you want it to, whereas the SOHC unit’s limit is 8,500 RPM, so requires more frequent gear-changing. The 1200S just kept on charging, heading for a neck-straining top speed of around 240 km/h. I didn’t approach that because it was soon time to turn off for a short built-up stretch, where Urban mode showed its benefit with a softer, smoother still throttle response that would be particularly welcome in the wet. Switching mode also alters settings for the DTC traction control and ABS braking, optimising them for lower grip. 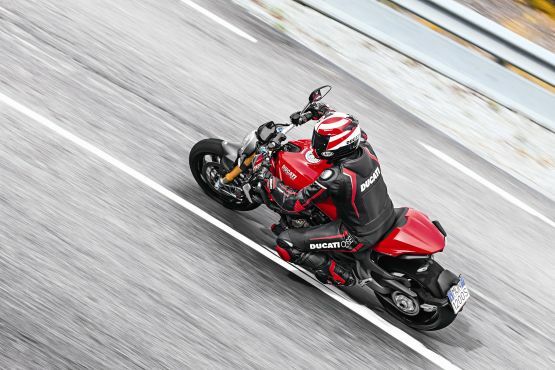 It’s a shame that, unlike the Multistrada, changing mode doesn’t also adjust the suspension.